465 x 461 pixel album cover included with any song purchase. 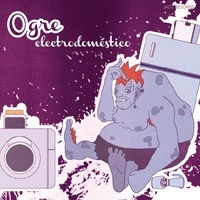 "Electrodoméstico" (JACC Records) is OGRE's debut album. The band mixes jazz with electronic music is headed by internationally acclaimed singer Maria João and includes João Farinha on fender rhodes and synthesizers, pianist Júlio Resende, drummer Joel Silva and Andre Nascimento on laptop and electronics.